Constructed from ultra-lightweight PU coated 100% waterproof poly-nylon fabric that has been specially treated to avoid sticking when worn over textile or leather garments. (Black fluo colorway incorporates poly-textile panels for colorfastness). All seams are tape-sealed for guaranteed waterproofing performance. Light poly-mesh lining improved internal air circulation and comfort. 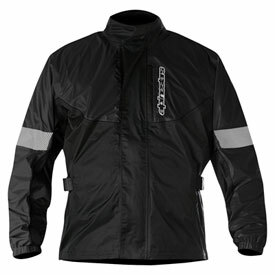 Reflective detailing improves visibility of rider in poor weather conditions. Comes with convenient storage/transport bag to easily fit inside luggage. Velcro adjustments on the arms and waist and shock chord adjuster ensure close fit over outer garment. Elasticated collar and cuff help form hermetic seal to avoid wind and water penetration. Waterproof compartment on inside chest for easy access and peace-of-mind storage.